Successfully Added USB Multi Display Adapter for Computer - Add-On More Monitors to your Shopping Cart. Meet the USB Multi Display Adapter for Computer - Add-On More Monitors, is designed for adding an additional monitor (VGA, DVI or even HDMI) to your computer, allowing you to multitask and run multiple programs on multiple screens at once. It makes all the difference! Let me ask you a simple question. Do you want to add another monitor to your laptop or desktop? Of course you do! If you use your computer for watching movies, checking the news, surfing the net, playing games, chatting with your friends, monitoring your stocks, blogging, programming, design, research, homework, or multitasking all of these at the same time, you will love the added convenience of a second monitor. 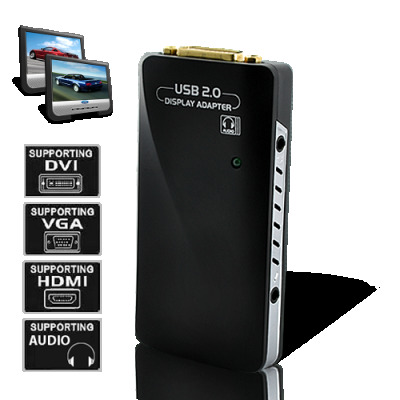 Now with this multi-display adapter, you can add extra monitors right through your USB port! How you use all your extra screens is up to you. This amazing gadget is great for home business owners, news junkies, online- shoppers, pro bloggers, power socializers, professional photographers, video editors, game addicts, movie fanatics, and those who want more monitor room. -Keep the news open on one screen. Monitor your stocks on another screen. -Put a movie on one screen so your girlfriend won't bother you while you chat with all your buddies on yet another screen. -When you're ready to stop "working" and start really relaxing, conveniently maximize a movie or video game window to cover all of your other screens at the same time. This multi display adapter plugs right into your USB port, making it by far the easiest and cheapest way to add an additional monitor to your laptop or desktop. This display adapter supports a wide range of resolutions, orientations, color depths, and monitors: DVI, VGA, or even HDMI! Plus, this device works with both PCs and Macs, so everyone can enjoy multi-screen computing. Connect one of these display adapters for each additional monitor you want to add, install the included software, and watch your monitors come alive! For such a handy gadget at such an incredible price, what more could you expect? Available in our warehouse now, add it to cart now and we'll express ship it out tomorrow! Brought to you by the leader in wholesale electronics - Chinavasion. What is the max number of additional monitors I can have with this adapter? 6 additional monitors. If you count your primary monitor, you can have a total of 7 monitors. Please note that you will need one adapter for each monitor you add. Does this adapter have to plug right into my computer? No. Use the included USB to mini-USB cable to connect this adapter to your computer. This gives you more flexibility in positioning the adapter and your monitors. Is this multi monitor adapter easy to setup? Yes, very. The included user manual is very detailed and well- written, and the software is easy to install and use, too.